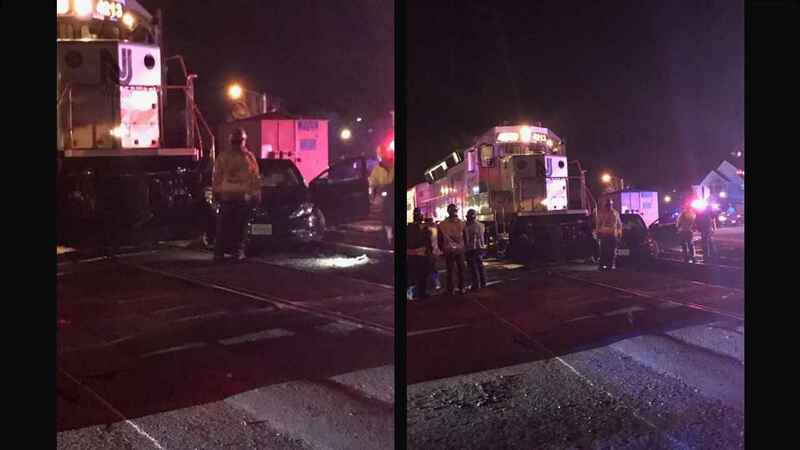 LONG BRANCH, New Jersey (WABC) -- A family escaped their car after it became stuck on train tracks and was hit by a train in Long Branch Thursday. The driver went around road barriers on Brighton Avenue, and onto a section of road closed to traffic by ongoing construction. The driver later said they thought they were driving into a parking lot, but instead got stuck on the New Jersey Transit train tracks. The family was able to get out and call police, who alerted the train's engineer. The train slowed down, but ended up striking the front of the car. The family got out before the train hit their vehicle, and no passengers on the train were injured. Service on NJT's North Jersey Coast Line was suspended, but train service resumed just before 11 p.m. Thursday.